I hope that everyone has had a productive yet restful weekend. We have an important week ahead as our students prepare for our annual performance evaluations. NO Symphonic Band rehearsal due to Tuesday’s concert. All-State Band in Athens. Congratulations to Taylor Berry and Kendall Ozier on making the All-State Band! Winter Guard performs at the WGI Regional at McEachern High School. Their performance for Saturday is at 11:34AM, and their performance time on Sunday depends on how well they perform on Saturday. Large Group Performance Evaluations (LGPE) are right around the corner. We are excited that this year our performances for LGPE are local! The performances will take place in the new Carroll County Performing Arts Center and are free and open to the public. We would be honored if you were in attendance! Below are the performance times. Itineraries will be posted soon. If you have any questions, please make sure to contact Mr. Carr at: christopher.carr@carrolltoncityschools.net, the Band Office at 770-834-0550, or the Band Boosters at: chstrojanbands@gmail.com. Posted in CHS Band and tagged #trojangold, Carrollton High School, Carrollton High School Band, Carrollton Trojan Band, CHS Band Program, CHS Winter Guard, Gold Standard on February 25, 2018 by CHS Trojan Band. Reminder! 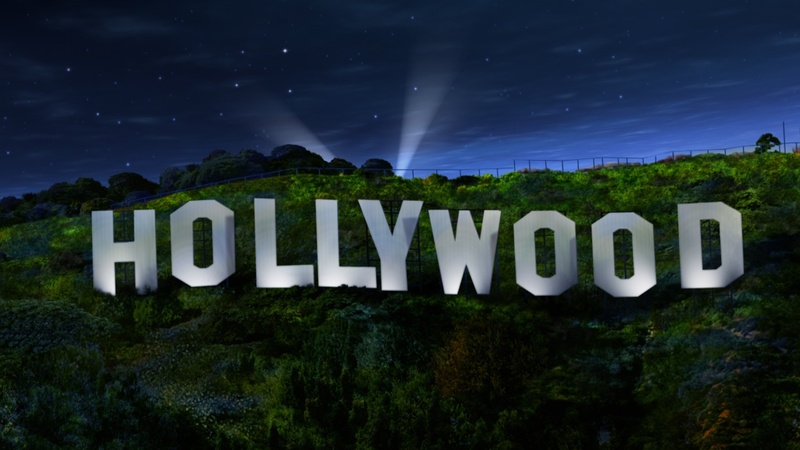 If you plan to pay for the Hollywood trip monthly, tomorrow, February 23rd, is the first payment due date. Monthly payments are $188 per student and $203 per adult chaperone (for a double occupancy room). Payments may be made in cash or check payable to CHS band boosters and placed in the Band Booster box in the band room. Payments may also be made by credit card to Super Holiday Tours at www.superholiday.com. Please see last Saturday’s post: Hooray for Hollywood – Trip Updates for details on how to sign up on the Super Holiday Tours website. Posted in CHS Band and tagged #CHSHollywood, #trojangold, Carrollton High School Band, Carrollton Trojan Band, Carrollton Trojan Band Boosters, CHS Trojan Band, Gold Standard on February 22, 2018 by CHS Trojan Band. Congratulations to our Winter Guard! Yesterday the winter guard competed at the Knoxville Winter Guard International (WGI) Regional! They placed 5th in prelims and 3rd in finals! Way to go ladies!!! We are so proud of you! Come out and watch them compete this Saturday at Villa Rica High School! Monday – don’t forget we DO have school! Congratulations again to all the the junior high and high school students that participated in District Honor Band this weekend in Ringgold, GA. The concerts were amazing and the students represented the Trojan Band with class and excellence. Don’t forget to begin making payments for our trip to Hollywood!! Posted in CHS Band and tagged #12tothemoon, #CHSHollywood, #trojangold, Carrollton High School, Carrollton High School Band, Carrollton Trojan Band, Carrollton Trojan Band Boosters, CHS Band Program, CHS Winter Guard, Gold Standard on February 18, 2018 by CHS Trojan Band. Greeting Everyone! Please review the following information carefully! It is important that ALL travelers stay current on updates and payments for the trip to Hollywood. Please review the attached document from Super Holiday Tours. It includes payment deadlines and trip details. Payments may also be made by credit card directly with the travel company. Please see the attached link for instructions for using the Super Holiday Tours website. The $50 deposits that have been made for all registered travelers have been sent and will be added to the website over the next few days. Please do not get behind on payments! We want everyone that has signed up for the trip to be able to go!! Please remember you can be mailing out Make Me A Whole Person forms to friends and family! Donations can be made online or by cash/check. All donations go to the student designated on the form! Posted in CHS Band and tagged #CHSHollywood, #trojangold, #trojansallin, Carrollton High School, Carrollton High School Band, Carrollton Trojan Band, Carrollton Trojan Band Boosters, CHS Band Program, CHS Trojan Band, Gold Standard on February 17, 2018 by CHS Trojan Band. I hope that you remembered to pay your trip deposit for Hollywood! If you have not paid for you or your student, please contact Meredith Harris at barryandmer@bellsouth.net or 678-850-8317. We have over 120 students committed plus chaperones! It will be an amazing opportunity for our band program! Please note: we are no longer accepting deposits through Revtrak, but we will be accepting donations for Make Me a Whole Person through Revtrak until November, cash and checks are also options. GSU in Concert THIS WEEK! Thursday, February 8th! 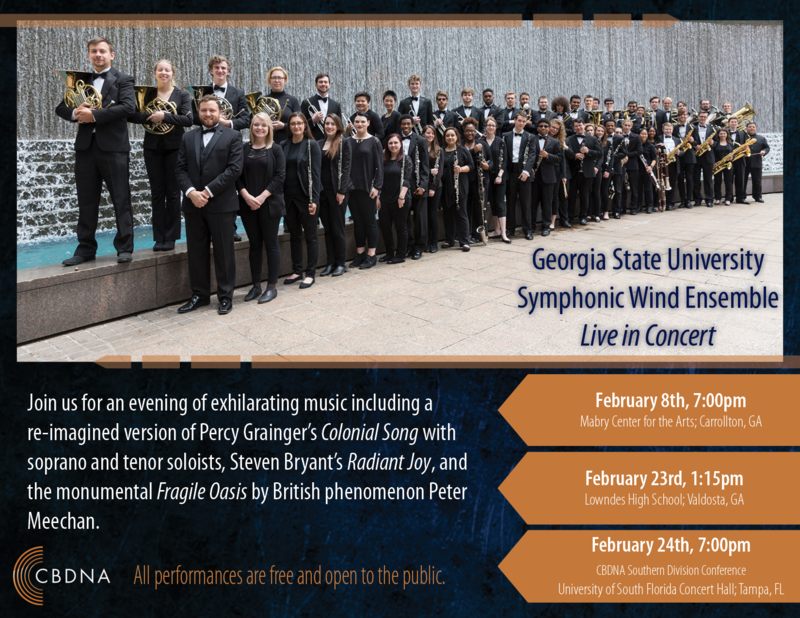 Georgia State University Wind Ensemble is performing a special performance for our community at 7:00PM in the Mabry Arts Center. Admission is free and open to the public. Attendance is required for all Carrollton High School band students. GSU is preparing for the College Band Directors National Association Conference, so this will be an inspiring performance for our students! Don’t miss it! Posted in CHS Band and tagged #CHSHollywood, #trojangold, #trojansallin, Carrollton High School, Carrollton High School Band, Carrollton Trojan Band, Carrollton Trojan Band Boosters, CHS Band Program, CHS Trojan Band, CHS Winter Guard, Gold Standard, Trojan Band Boosters on February 4, 2018 by CHS Trojan Band.